The Social Science is branch of science that deals with the sociocultural aspects of human behaviour. The social sciences generally include economics, cultural anthropology, political science, Sociology, criminology and social psychology. Comparative law and comparative religion (the comparative study of the legal systems and religions of different nations and cultures) are also sometimes regarded as social sciences. Social Science is, in its broadest sense, the study of society and the way people behave and impact on the world around us. Although human social behavior has been studied since antiquity, the modern social sciences as disciplines rooted in the scientific method date only from the 18th century. Enlightenment interest at first centered on economics, but by the 19th century, separate disciplines had been developed in anthropology, political science, psychology, and sociology. Each of these subjects uses a range of approaches to carry out the study of society - from the collection and analysis of statistics to the collation of responses to questionnaires and each step requires a different approach. Like the other sciences, the social sciences evolve through the interplay of the ideas and theories of academics, and the evidence that supports or refutes them. Some experts however argue that no single definition can cover such a broad church of academic disciplines, deploying a wide range of approaches to gathering evidence. Instead they simply define the sciences by listing the subjects they encompass. The term "social science" may refer either to the specific sciences of society established by thinkers such as Comte, Durkheim, Marx, and Weber, or more generally to all disciplines outside of noble science and arts. 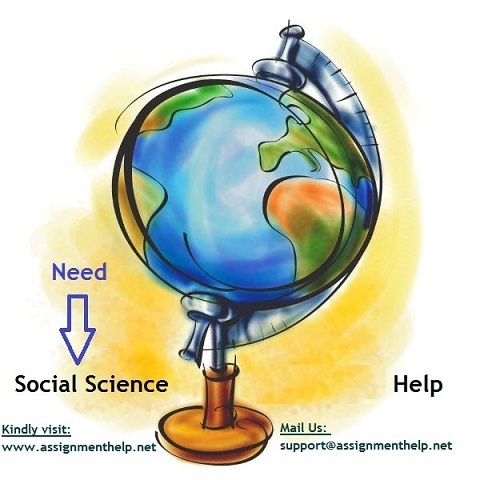 We at Assignmenthelp.net offer the wide range of online tutoring services to the students namely social science assignment/homework help and online tutoring in social science. We also provide help in Arts, Science, History, Psychology, Geography, Essays, Report, Term Papers and Research Papers writing for K-12, College and University level students.